It happened about a month into preschool: I sent my son to school with a peanut butter and jelly sandwich. Gone were my dreams of a perfectly tailored lunchbox, filled with turkey, avocado and cucumber sandwiches, aged cheeses and homemade hummus. I was starting to feel guilty about this plain, uninspired lunch I had prepared when it hit me: Why was I beating myself up for giving my kid organic peanut butter and jam on whole-grain, organic bread? There are worse things! I think sometimes, as parents, we go overboard trying to feed our kids healthy food just as we worry that we’re giving them too many sweets. If my 3-year-old finishes his lunch (including the carrot sticks and bell peppers that I’ve packed in his lunchbox) because I also threw in PB&J — well, then I think I’m doing OK.
Getting kids to eat healthy foods is easy — if you have a kid who really likes healthy food. Despite his desire for a daily PB&J lunch (and probably breakfast, too, if he could get it), my 3-year-old really loves wholesome foods. My 18-month-old, on the other hand, will eat exactly three green vegetables and throws the rest on the floor. So what do we do at our house? We do our best to put healthy food on their plates and in their lunchboxes, and then we hope they eat it. If they don’t, we move on and assume that, unless our doctor raises concerns, we will still raise healthy and well-balanced children. That said, we do try to keep to relatively clean eating most of the time when we’re at home. We incorporate green vegetables into smoothies, pasta sauces and muffins. We keep putting the same healthy foods in front of our boys and hope that at some point they will like them. We make sure that they see us putting healthy food on our own plates. Being a restaurateur and the wife of a chef doesn’t mean that it’s always easy to come up with creative, healthy recipes. Actually, my husband might say that I’m a borderline bad cook. (I might agree.) As a working mom, I don’t have a lot of time to spend with cookbooks, but I do follow some Instagram accounts that offer good ideas for lunches, snacks and dinner. I like Real Food Whole Life for dinner ideas; Weelicious posts a lot of inspiring lunch box pictures and recipes; and Allrecipes is just a good standby for general cooking ideas. Often my meals don’t look nearly as pretty as the filtered Instagram shots, but it’s important to me to keep reintroducing foods in new ways. So, I keep trying different things. I add new spices to foods that the kids didn’t previously like and then I pat myself on the back when I get a winning combo. I don’t know if I have any amazing advice that other parents haven’t already come up with. Sometimes — OK, a lot of times — it’s really hard to suit up for a dinnertime battle, especially after you’ve all had a long day at work and at school. 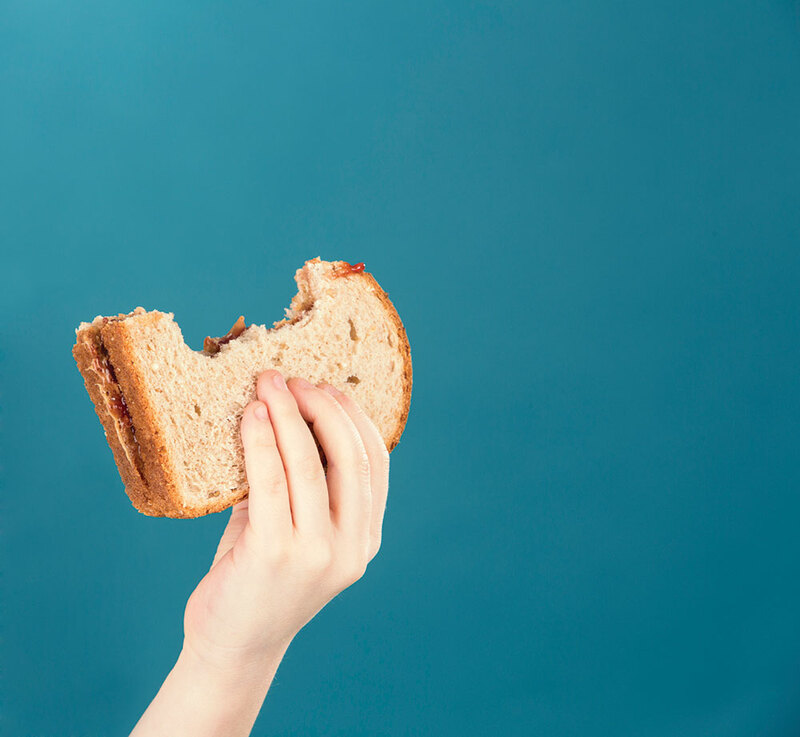 But I think we as parents should give ourselves a little more credit for just doing the best that we can to feed our children’s souls as well as their bellies — even when that means spreading an organic peanut butter and a nice jelly on healthy bread and calling it good.